Bosnian Serb leader Milorad Dodik claims the final verdict in Radovan Karadzic’s trial will be unfair, while Bosniak war victims’ groups want a tougher sentence – suggesting that the ruling will only perpetuate ethnic divides in Bosnia and Herzegovina. veryone knows that the [Hague] court is not fair, does not try people in accordance with the law, and does not work in favour of reconciliation,” the Serb member of Bosnia’s tripartite state presidency, Milorad Dodik, said on Monday in Banja Luka. He added that he does not trust the UN-backed Mechanism for International Criminal Tribunals in The Hague, which is due to hand down its final verdict in the trial of former Bosnian Serb political leader Radovan Karadzic on Wednesday. Dodik, the longtime post-war political leader of the Bosnian Serbs, testified for the defence in the trial, insisting Karadzic was innocent. Just before the Hague court’s first-instance verdict in 2016, he said he respected his wartime predecessor as “a man with strength and character”. On the other side of Bosnia and Herzegovina’s ethno-political divide, Semsudin Mehmedovic, a lawmaker in the state parliament from the country’s leading Bosniak party, the Party of Democratic Action, complained that some politicians support wartime figures like Karadzic even after they are convicted. “Certain political forces in Bosnia and Herzegovina still side with convicted criminals and joint criminal enterprises, which are glorified, and genocide, which is not admitted. Such politics are alive in Bosnia and Herzegovina,” Mehmedovic told BIRN. 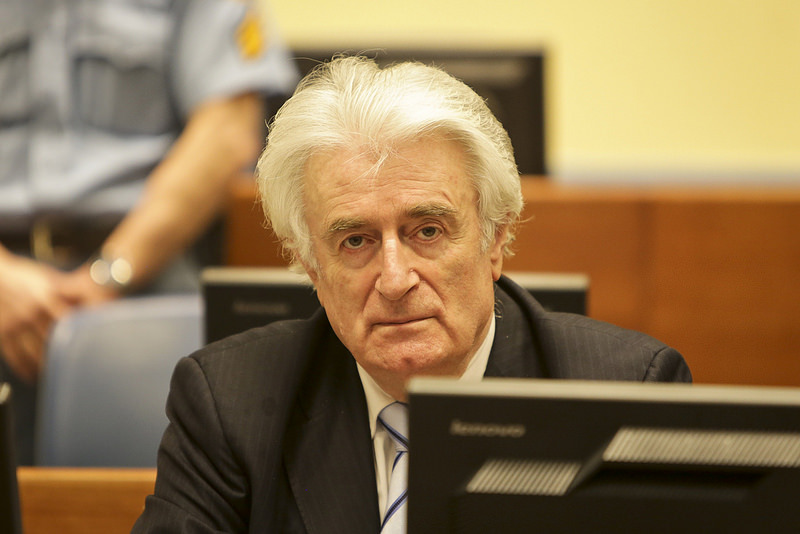 In the first-instance verdict, Karadzic was convicted of genocide in Srebrenica, the persecution of Bosniaks and Croats throughout Bosnia and Herzegovina, terrorising the civilian population of Sarajevo and taking UN peacekeepers hostage. Reactions to the first-instance verdict again highlighted the persistence of post-war ethnic divisions in Bosnia and Herzegovina, and analysts believe that next Wednesday’s ruling will do the same. Sociology professor and political analyst Slavo Kukic said that for Bosnian politicians, the actual verdict is less important than using it to bolster their positions. He explained that Dodik, while he was in opposition and Karadzic was on the run, said that the former Bosnian Serb leader should be arrested. Recently however, Dodik said that Karadzic deserves respect for creating Republika Srpska. “If they confirm the verdict [convicting Karadzic], he [Dodik] will use it as a proof of a conspiracy against the Serb people. Not for Karadzic’s sake, but for Dodik to reinforce his political position,” he added. Wednesday’s verdict will come amid continuing inflammatory rhetoric sparked by several recent ethnically-divisive developments. In January, the Bosniak-led Party of Democratic Action launched a challenge to the name of the country’s mainly Serb entity, Republika Srpska, asking the constitutional court to rule on whether the name of entity is discriminatory against non-Serbs. In February, Republika Srpska set up two new commissions to examine wartime crimes in Srebrenica and Sarajevo, and was accused of seeking to distort legally-established truths to whitewash Serbs’ role in atrocities. Analysts believe the Karadzic verdict will not be received from the point of view of facing the past and accepting crimes, but from ethnically-based standpoints. Asim Mujkic, a professor at Sarajevo University’s Faculty of Political Sciences, argued that it will actually strengthen nationalist rhetoric. “Unfortunately, projects to establish mono-ethnic states, in which one people dominates with as few members of the other peoples as possible, still exist in Bosnia and Herzegovina. I think that, just like all the other verdicts pronounced so far, this one will serve the various sides to develop such political narratives,” Mujkic said. Like any other news related to war crimes in the region, the final verdict in the Karadzic case will trigger “mostly negative reactions”, suggested analyst Zarko Papic. “It will stir up the political scene in Bosnia and Herzegovina, because one side will always be dissatisfied,” Papic said. Nenad Stevandic, a longstanding member of the Serb Democratic Party and an MP in the state parliament, argued that the Hague court has fostered “dispute and instability in the region”. “If we continue rubbing salt in wounds and sticking our truth like a finger in other people’s eyes, then we will be burdened with the past in the future as well,” Stevandic said. “We in Republika Srpska think that a geopolitical map is being drawn by convicting Serb leaders, who get the longest sentences, while the others get shorter ones. And they use that as a joystick to control the future in Bosnia and Herzegovina,” he added. Borislav Borenovic, president of the Party of Democratic Progress, said the most important thing is for the Karadzic verdict to be fair, but was also pessimistic about how it will be received in an ethnically-divided nation. “In any case, it will stir up the public in Bosnia and Herzegovina that day, because it will surely be received differently in Republika Srpska and in the [Bosniak- and Croat-dominated] Federation of Bosnia and Herzegovina [entity],” Borenovic said. Bosniak politicians expressed similar concerns: “I am not sure whether this verdict will bring anything good to Bosnia and Herzegovina,” said Mehmedovic. The president of the Croatian Democratic Community 1990 party, Ilija Cvitanovic, said that he thought that the verdict should determine what had been done in the past war, what people’s intentions were and what the consequences for the country had been. “Eventually, we shall get clearer answers as to what Bosnia and Herzegovina may possibly look like in the future,” Cvitanovic argued. But whatever the verdict turns out to be, political analyst Kukic said he was convinced that it will exacerbate ethnic divisions in the country.